25,000 lb. 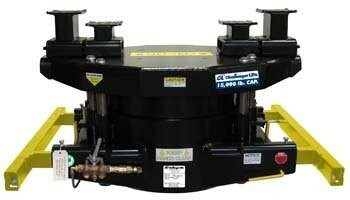 capacity air/hydraulic rolling jack features adjustable width from 45″ to 55″. Two handed unlocking system ensures hands are always in a safe position and air valve features three-way spring loaded no spark design for safety and durability. A perfect compliment or package for the heaviest automotive lifting – 40,000, 50,000 and 60,000 lb. capacity heavy duty four post automotive lifts.